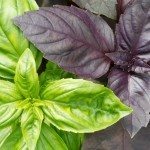 Is it ok to eat basil leaves spotted with rust? There are no raised bumps underneath! Leaves were fIne until the end of summer!